Air compressors make any work or project you wish to carry out much easier and simpler than it used to be. A few years ago most of the air compressors you would see outside of an industrial setting would be found in gas stations. Over the years, however, you can now find air compressors much more suited to the less obvious industrial setting and even compressors which are suitable for use in the domestic garage or garden. You may have never thought about installing an air compressor into your home garage before, but they can be very beneficial. Essentially the main benefit of having an air compressor is that they take out a lot of the hard work that goes into using wrenches, and hammers, etc usually. Air compressors simply alleviate the effort needed to use these tools. Most often air compressors are used for cleaning stone of brick as well as powering home tool equipment like staple guns, as well as powering hammers or saws. This means you can finally stop putting off that laborsome project because once you purchase an air compressor, the jobs effort will be halved! We know looking for a compressor can be daunting at first. But trust is we’re not experts either, we’re just like you, and we found it’s not that hard at all. View the Best Air Compressors for Home Garage, Below. What size Air Compressor for a Home Garage? How to Setup a Garage air Compressor System? What Oil Goes Into a Garage Air Compressor? Looking for something more industrial? Try a 20-gallon model or even a 30-gallon option. To get your compressor to work all you need to do is connect it to your power tools and you can get going. We understand there is so much reading and jargon attached with buying a compressor but don’t you worry if you read this article we’ve done the work for you. We pulled together the best 10 air compressors we could find on the market, all you need to do is check which is best to use alongside your favorite tools and you’re ready to go! 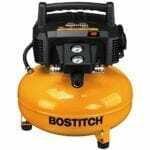 The Bostitch comes with a 150 max PSI 6.0-gallon tank, a 2.6 SCFM and a 90 PSI pump. This means you’ll be able to run your compressor for a pretty long time and when it finally does need to cool down, it will quickly and quietly so you’ll be ready to use it ASAP. The compressor operates at 78.6 dBA which means you’ll be able to work in a quiet environment which is handy if you’re thinking of using this compressor in a home garage environment. What we loved about this compressor is how easy it is to store. It’s 29lb. Weight makes it small and narrow enough to carry to a different location or easily hide it away in storage. The Makita really makes use of modern design when it comes to making air compressors. Featuring an impressive 125 PSI, an even more lightweight design than the Bostitch above at 23.1 lbs. And even quieter noise at 72 dBA. As you can imagine this air compressor makes an ideal choice for home garage use it’s compact, stylish and quiet. Its design really lends itself to being carried around thanks to the easy grip rubber handle at the top and impact reducing suction pads at the bottom. This makes it suitable for ay carpentry, furniture or cabinet construction. Our favorite features of this compressor has to be the roll cage construction which provides extra protection of the motor and pump! This California Air Tool is nicknamed ‘Light and quiet,' and it really is one of the quietest compressors out there on the market with low decibel sound of 56! But don’t let the quiet noise levels of this compressor make you think that it won’t power up your tools efficiently. With 90 PSI you’ll still be able to use all your essential tools such as blow guns, airbrushes, and nail guns, etc. It’s also great for carrying around the house by weighing only 20 pounds. This compressor is a great staple for any household that requires using it for basic power tools and needs some peace and quiet. The best part about the California compressor is how unbelievably quiet it is as 56 decibels that’s less noise than your friends make watching a match. The Porter Cable is a great long life no maintenance compressor thanks to its oil-free pump and quick recovery time. You’ll also be able to carry it around easily thanks to its firm handle grip on the top, and it’s 30 lbs. Weight. You’ll also be able to carry this compressor around or plug it into an extension cord in any cold weather this is because of its low-amp 120 motor. All of these features combined make this product really great for any long use air tool. We loved the shape of this Porter Cable as it’s pancake shape makes it super sturdy with its 6-gallon capacity and rubber feet! The Pancake Compressor’s manufacturers really go out of their way to make sure every single part of using this compressor is easy and efficient for you to use at all times. From the lightweight 30 lbs and their quiet work noise of 75.5 dBA which allows you to take this compressor anywhere and not have to worry about causing too much of a hassle. This compressor continues to help you even after it’s initial use from the easy to store away design thanks to the cord wrap system and the ball valve for quick draining. We couldn’t really agree on one particular feature we like about this compressor as all of its features combined make it so easy and efficient to use. 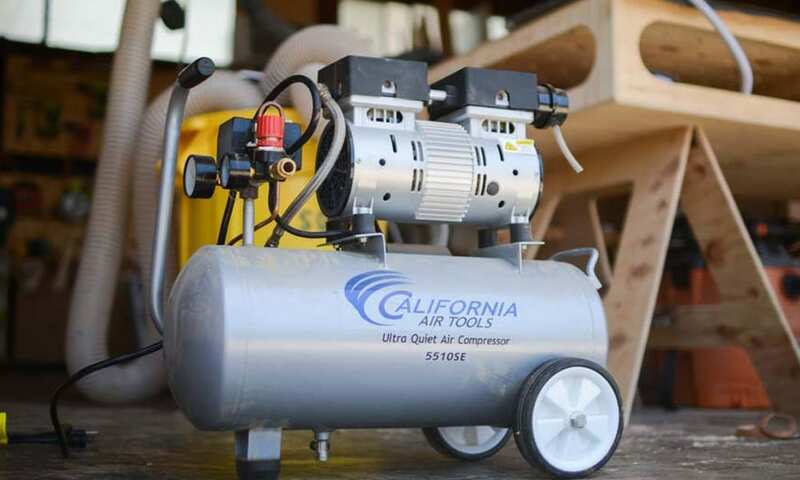 The California Air Tools is a great Ultra Quiet compressor that designed with household, garage and general domestic usage in mind thanks to its quiet 70 decibel sound. This new California series combines all of this portable quiet compress-ing with a motor operating system of 1680 RPM meaning it is designed for longer periods of time with a heavy-duty performance! This compressor is also oil-free which means you won’t have to oil it ever and it will also work well in cold weather and rocky terrains. We love how easy this compressor is to clean thanks to its oil-free compressor. This Makita is a luxurious cast iron pump which delivers maximum performance, with their substantially lower noise levels but a large power which is 2.0 HP Motor. This high-performance compressor means you’ll be able to have all the power of an industrial size compressor but with much lower maintenance and even lower noise output. You’ll also be able to use this compressor at its high-performance capacity for a very long time. This is thanks to it’s lower RPM which prolongs motor life giving you a durable product you can rely on! This Makita gives an overall great performance thanks to its low noise and low amp but super high output - and this is why we love it! The DeWalt is a great portable compressor, which provides 85% more than its competitors regarding air tool run time thanks to its 200 max PSI. The power that this compressor gives means it’s great to use with spray guns from 40 PSI right up to large projects such as car repairs up to 200 PSI. Many of the experts out there it’s great for small projects in a commercial garage or small projects around the home. And some even argue that being electronic and oil-free means they’ve ended up saving money. We liked how this is great for large home garages or small work environments. The Campbell Hausfeld is a great compressor for the home it’s versatile and durable enough to carry around. For instance, you can use this compressor to finish off many projects quickly from stapling to hobby painting and inflation. You’ll be able to undertake all of these tasks easily thanks to the 8 gallon and 125 max PSI power this compressor provides. And what’s even better is that thanks to its oil-free usage you’ll never had to deal with any dirty oil, so it’s super easy and requires no maintenance. We loved this Campbell as it’s great for outdoor use with an extension chords with-out waking up our neighbor's thanks to its low decibel humming. The Excell is a great product that is designed to last, with a dual pump compressor which even operates on slower speeds depending on your needs. This compressor is great as it is 80% quieter than other standard oil-free compressors at only 61 decibels and designed perfectly to work for various different jobs from home maintenance to crafts and hobbies. Its oil-free design makes it easy to use as it requires no cleaning, but this in particular compressor lives up to 4 times longer than most other oil-free compressors. Our favorite feature with this product has to be the roll cage design which keeps the pump and motor safe and makes for easy portability. We hope you’ve enjoyed reading the 10 product we reviewed just above and we now hope you understand what compressor products are out there on the market. There are lots of different sizes and strengths available, and we know it can be incredibly tricky to identify which is best for you. To help you decide the paragraph below discuss in further detail different things to consider when purchasing a compressor. When buying an air compressor, the size can really vary depending on what you’re using it for. The size of your compressor needs to be powerful enough for the tools you will be using it with. Of course, when it comes to using these in home garages, you might not be able to take on compressors with as much strength. When it comes to the CFM rating, we recommend anything between 9.0 CFM and 14 CFM. With the 9CFM being more suited for homes and tools needing less power and 14 CFM being more suited for stronger power tools. You might just need a small air compressor. 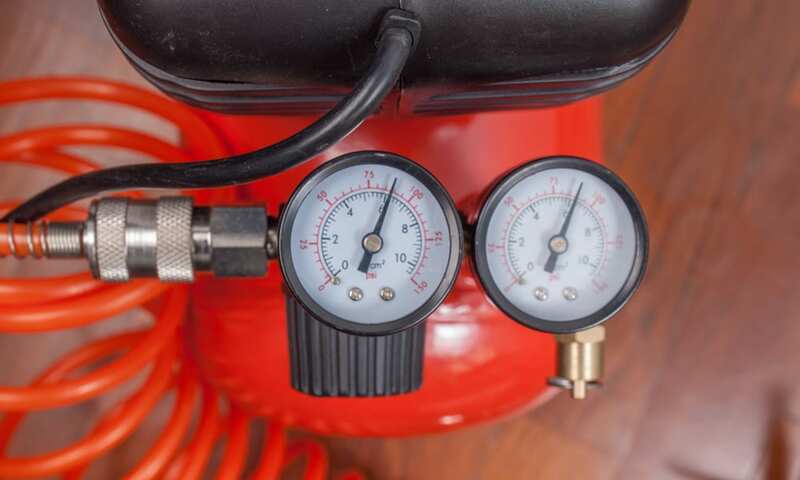 On the other side of the coin, when it comes to the pressure, the compressor produces you will probably discover that most tools will need around 90 PSI. Again this all depends on what tools you will be using it will but basically the lower the PSI and CFM of the compressor the lower the power and the higher ratings, the higher the power of tools you can use. Another important feature to consider when buying an air compressor is the duty cycle. The duty cycle is how long you can use your air compressor for before it reaches maximum heat and will need to cool down by shutting off. Experts recommend if you want to get the best usage out of your compressor you will need to select one with at least a 50% cycle. Another factor to consider when which type of compressor to buy is whether or not you would like an oil-based lubricated compressor or an oil-free one. Oil-less compressors are usually cheaper than the oil-based equivalent. Air compressors in general draw in air into a storage tank and need to keep the piston chamber lubricated in order to keep drawing in air. The oil-based compressors need constant lubricated from oil. Whereas the oil-free are usually permanently lubricated from construction with Teflon. Both of which come with different benefits. For instance, oil-free compressors usually require little to no maintenance and are great for using around the home. However, they do not last as long as the oil-based compressors as the Teflon that lines their piston will eventually wear out. Oil-based compressors are a lot more complicated to clean however they will last longer, and this is why you will usually find these more in industrial settings. It depends on how you’re going to use your compressor and how often you will use it. Air compressors take in air and convert it out into a higher pressured amount of air. This is required for using power tools of various shapes and sizes. The compressor store the energy of gas within the storage tank. You must look after your compressor otherwise it will not last as long. Cleaning your compressor will vary from model to model especially if it is oil-based or not. But in general, you should consider following these steps to help prolong the lifespan of your compressor. You can release the moisture from the valve after every use. Not only is this important to keep it working at it’s the best performance every time you use it. Removing the moisture will also prevent it from becoming rusty. Every now and again you should also check the components and valves are all in the right places and as tight as possible. If anything has moved, you should make sure you replace them as soon as possible. From time to time your compressor may not be functioning as well as it normally does if this is the case you should check whether or not the valve on it is safely positioned. If your compressor is oil-based, you should make sure you lubricate it on time. Of course, it completely depends what you’re using your compressor for the air compressor must meet the required size of your tools. We would recommend a compressor of around 9.0 CFM. It Is surprisingly easy to install an air compressor but more complicated than plugging it in. You must first take notice of the paragraph above if you’re installing it into your home to make sure it is suitable. Firstly you need to assign the area you’re going to place your compressor in as well as assessing how much you will have left to use your power tools. You should also place down some isolator pads, and this will help stabilize the compressor in place as well as minimizing the noise from its vibrations. And let’s face it no one wants to be shouted at for making too much noise while trying to use their tools. After this, you need to look at your attachments and select the right size. Then after reading the manual attached you set up the compressor and attached to the power outlet you’ve selected for its use. It should go without saying that not all compressors require any oil at all, as some are completely oil-free. However, the air compressors that do require oil, requiring lubricating now and again. It may seem like a complicated, and you don’t want to damage your machine by putting in the wrong oil. Some customers would argue that it doesn’t matter which oil you put it as it will all work in the same manner. When we spoke to experts, however, they said it is best to put an air-compressor oil in your compressor as opposed to motor oil. They recommend using specially designed oil rather than normal automotive oil usually has more detergents in it which can damage your machine. If you want to keep your air compressor running as best as it can for as long as possible, make sure you always drain the moisture from the tank after every use. Oil-less compressors will get hotter as there is no wet oil instead the piston to cool it down. We hope you enjoyed our article on "10 Best Air Compressors For Your Home Garage in 2019", if so, please share and rate it.